With four more inches in depth added to the standard 12, the Elite 32" Storage Cabinet offers you even more storage potential for your laundry room, workshop or garage. It has one fixed and two adjustable shelves, allowing you to fit a wide variety of items. Use it alone or add the optional 32" Stackable Wall Cabinet on top for a total of 89 vertical inches of storage. Dimensions 16.0 In. X 32.0 In. X 65.0 In. 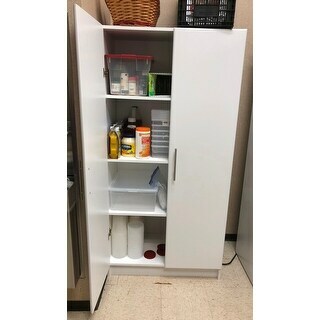 We purchased this item to act as a freestanding pantry in our kitchen area at work and it is exactly what we needed! It is quite sturdy and has plenty of room for storage. The shelves hold weight well and we were even able to anchor it to the wall to assure some added stability. This shelf would be great for plenty of other uses as well. I purchased this cabinet for my new salon. It was delivered faster than expected, which was perfect for our opening. I (a female) assembled this all by myself so it's pretty easy to put together! It holds all the skin care products, cleaning supplies & extra equipment for the spa room. It is very sturdy; I am not worried it will collapse during a treatment. Its not as tall as some of the other cabinets I looked at but I like it that way. I am short and so are many of the females that work for me so we can reach everything with easy. I can even use the top of the cabinet for more storage (the xm radio & ipod dock). I am very pleased with my purchase and would recommend this cabinet to anyone interested. Very easy assembly...despite the fact that none of the boards are labeled. Just follow the pictures in the instructions and you can figure out which piece goes where. Best is to assemble the door hardware first, so that you know which is the left & right door. The piece is very heavy, so having a second pair of hands will be helpful. The hardest part is getting the doors to line up, but once that is done...the piece will exceed your expectations for a 'put it together yourself' cabinet. 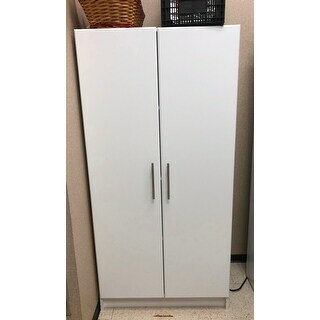 The cabinet is heavy, very sturdy, has adjustable shelves, has nice hardware, and the curved edges on the doors give it a quality appearance. Bought 4 of these cabinets for our garage. Very sturdy and absolutely love them. Good quality and look wonderful. This is an awesome cabinet for the price. It IS made of particle board, but is much more sturdy than other shelves I've purchased in the past. Assembly was easy. The hinges for the doors are heavy duty and because they are adjustable, ensuring the doors are even and level was simple. 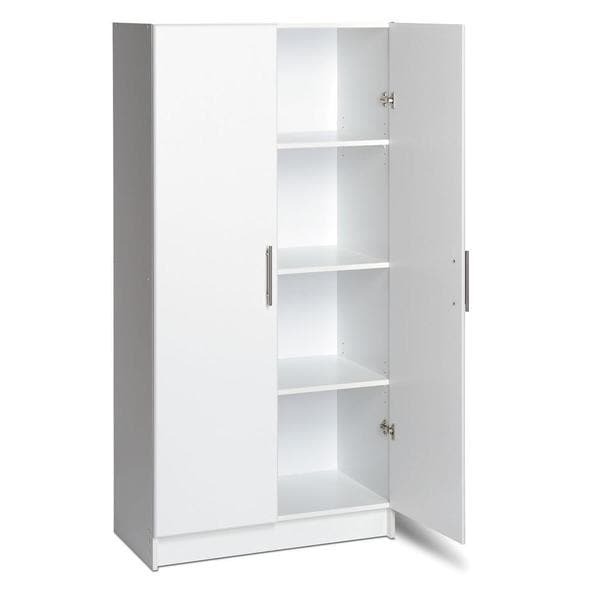 I purchased this to use as a pantry, as my kitchen is tiny and has virtually no storage. All my dry goods fit nicely. This cabinet was packed very well with heavy foam inserts, so none of the individual pieces were damaged. I do recommend this as a solid piece of furniture if you need something both useful and cost efficient. Poor quality! Do not buy! the instructions were not efficiently written. first, they want you to put the boards together with the back on the floor then turn the entire (very heavy) unit over to install the backing. it's smarter to place the unit face down so you don't have to turn it over to nail the back then turn it face up again to finish installation. second, the doors are so heavy that the unit tilts forward when both doors are opened. third, the hinges are so rigid that you can't adjust the vertical gap between the two doors. my ikea wardrobe cabinet is of better quality and price. overall, i don't recommend this product. i'm very disappointed in wasting my money on a poor product. This is a well made storage cabinet. The price is spot on. I assembled the cabinet by myself without to much trouble. Very good storage space and looks beautiful in my laundry room with the other cabinets I purchased. I have ordered the smaller tall cabinet to go with this one. Attractive, Sturdy and Stable Storage Cabinets with adjustable shelving. Nice smooth white finish inside and out, nice looking handles and hardware. Son assembled it for me, very pleased with purchase, just ordered a second one. For the price, I feel that this storage cabinet is perfect. I had two handymen I use assemble it for me, and they said it was easy to put together. It's attractive for what it is, has adequate capacity for what I need, and is a great addition to my laundry room. Easy to put together about 45 mins. It made of particle board, but sturdy. Very easy instructions. For the cost, it's good. Looks great! I went by other reviews when I ordered - SO GLAD I DID - This isn't your regular put together furniture. I've been looking for an armoire for my 19 yr old daughter and couldn't find anything we liked or reasonable in the furniture stores. 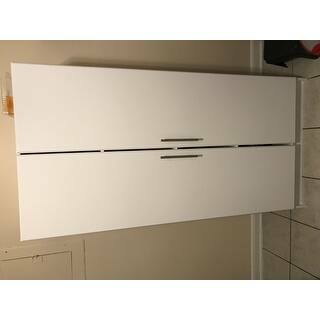 This piece is sleek and modern and really good quality - we were very impressed! So impressed I'm going to order the caps (more storage without taking up floor space) for the top of the armoire and the floating desk and hutch. Don't hesitate to buy - easy to put together. Like I said I will be buying more from Prepac! I can not complain about this piece. Just as described. Took about 30min to get together. Overall i am impressed at the way it's holding up. One down side is the doors. They do not close quietly. One door does not close smoothly therefore tends to bang the sides. Alittle annoying and also it's a little pricey. That is why i give it a 4. Otherwise it provides extra storage and alot of it at that which I am happy with. Well built; should last many years. Has a satin/matt finish. I think it will hold up to cleaning if a sponge is used. Would buy again. Great quality product, the build/install was very easy. Ours did have a decent gouge/scratch on one of the panels but luckily it's hidden for the most part. I will say I thought the piece would be much taller, I guess I didn't pay attention to measurements, but it's fairly short for a cabinet especially at this price point. I like the unit. Would suggest labeling the parts for easier assembly. Also, I am still working with two of the three units as to why the doors have a little gap. These are great cabinets. I bought two. They are pretty easy to put together and sturdier than I thought they would be considering that the cost was pretty low. I would definitely buy more if I had the space. Happy with this product.Happy with this product. Absolutely love this! I got the Espresso finish, which is beautiful. The box it came in was very heavy, had to bring the pieces into the basement separate. Relatively easy to put together. The doors function well and two of the shelves are adjustable height. Put it together all by myself without my hubby's help. the best ever purchase . Just love it. Very stylish, good looking and very roomy. I bought 2 of them for my son's room and he also loves it. I bought them in white. We bought two of these. They are spacious and well built. I love this storage cabinet. It seems to be quality but the doors doesn't fit quite right. It have a gap but other than that I couldn't have ordered a better item to suit my needs. like anything else, with the proper preparation, you should be able to paint it. call manufacturers to be certain. This should not be painted. "Cant find the dimensions and materials listed. Shipping weight or assembly info, maybe its assembled." Shipping weight which is 121 lbs). Assembly is required. Assembled dimensions are 32"w x 65"h x 16"d. Product is made of laminated composite wood. "Does this item ship UPS or by truck?" I ordered 4 of these and they came via UPS. "I need to stand a music keyboard on end which means I don't need anything but a top shelf. Is this possible? Can I run a lock through the handles?" This won't work because the middle shelf is fixed in the center section. Depending on the size of the keyboard, You could try our narrow cabinet (WEB-1664). You might be able to run a corded lock through the handles, but probably not a padlock. "What is the weight capacity of each shelf?" "Hi. Can anyone tell me what is the average time to assemble this unit? Thank you." Yes.......Yes, there are various levels of adjustments located on this cabinet. An organized garage is a valuable asset to any home. 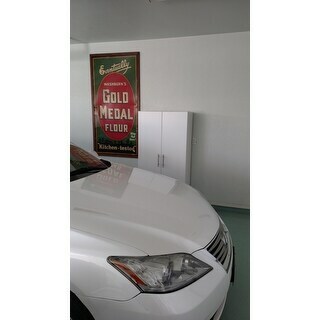 Reduce clutter and chaos in your garage with these convenient storage solutions from Overstock. Browse our selection of hanging hooks, storage shelves, and spacious cabinets to find exactly what you need to put your garage in order.